Ever since NHL was diagnosed with Asperger’s Syndrome, I’ve been on the lookout for books, TV shows, and other places where Asperger’s was covered. 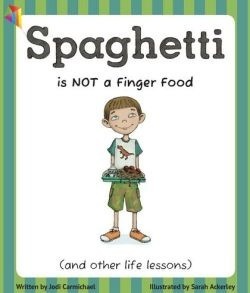 So when I heard about Spaghetti is NOT a Finger Food by Jodi Carmichael, I knew I had to read it. In Spaghetti is NOT a Finger Food, we are introduced to Connor, a third grade student with Asperger’s. As we follow Connor through the day, we see the various challenges and triumphs that he encounters. Since the story is told from Connor’s point of view, the reader gets a glimpse into how an Aspie sees the often-confusing neurotypical world. In addition, you get to see just how an Aspie’s good intentions can go horribly awry. A few sections of the book stood out to me. Early on, Connor (having been sent to the hall to calm down) re-enters the classroom. During his hall time, he has thought of a lot of gecko-related facts. His brain was positively bursting with facts that he just had to relate to his teacher immediately. So important was this, that he thought it was completely acceptable to squash another kid’s volcano science project, cut in front of some other kids, and interrupt everyone to tell them all the facts he remembered. Of course, we can realize the many places where Connor went wrong and what he should have done. In Connor’s mind, however, the gecko-facts were the most important thing in the world. His mind was obsessing about them so much that he could not, in the moment, stop himself, think about how his actions might be perceived by others, or even consider the possibility that other people might not be interested in his facts. The only thing that mattered was telling those facts. I can easily see parallels in this with NHL. When NHL gets something in his head, he has to tell everyone. He doesn’t realize when the people he’s telling aren’t interested because, to him, whatever is highly interesting to him MUST be highly interesting to everyone else. Another example of single-minded obsession comes into play when Connor – who loves everything to do with dogs – spies a new dogs book in the library. Since it is above his reach, he seeks out a stool. Unfortunately, a girl in his class is already sitting in that stool. Since Connor thinks that stools are for getting books from high up and chairs are for sitting, he doesn’t understand why the girl doesn’t move. In his mind, his reasoning is perfectly logical and his actions (pulling the stool out from under her) are completely justified. He is honestly clueless about why she would be upset and about why the teacher wouldn’t talk to the girl about chair-stool differences. Here, Connor shows how Aspies can sometimes "lock in" on one solution to a problem to the exclusion of other, more reasonable or socially acceptable solutions. Connor could have found another stool, stood on a chair, or asked his teacher for help, but when he saw a solution (stand on the stool the girl was using), he locked in on that and couldn’t let go of the idea. NHL does this too from time to time. His brain will lock into an idea and can’t consider other options. Honestly, though I’ve worked on this for many years, I still do this also all too often. Connor also has trouble telling what constitutes friendship. During lunch, he slurps his spaghetti messily which causes a girl at his table to laugh. Thinking that this made her happy, he slurps more spaghetti, then escalates it until he is dumping the spaghetti on his head. The entire lunch room laughs but Connor is oblivious to the possibility that they are laughing AT him. Instead, he thinks this means that they are all his friends. NHL can be like this too. It breaks B’s and my hearts when he describes a friend he has in school only to say hi to them and have them roll their eyes at him and ignore him. Recently, he’s gotten more aware of this which, in some ways, only makes the situation worse. He feels isolated and alone. Having gone through much of school feeling this, I can completely relate to NHL and Connor. Being an Aspie doesn’t mean you are anti-social. In fact, Aspies often want to socialize but don’t know how to. I’ve often described it as craving the spotlight but feeling intensely uncomfortable once it is shined your way. When it is on you, you don’t know what to do and just want to escape it. When it isn’t on you, you just want to get into it but don’t know how. My final example has to do with honesty. Aspies tend to be honest. Not just honest, but too honest. Honest to a fault. Connor repeatedly demonstrates this when, mistaking social cues, he tries to be helpful by relating what he thinks is pertinent information (for example, how a wrinkle cream he saw advertised on TV could erase his teacher’s wrinkles). NHL, too, is very honest. In fact, it is very difficult for NHL to lie. He tries, don’t get me wrong, but his lies are very easy to spot. A few probing questions and his attempted lie crumbles to dust as he tells the truth. Like NHL, I have problems lying as well. Lying about anything major (say, more than a birthday present) is a very stressful endeavor. I can try but the truth will blurt right out of my lips before long. I really enjoyed the glimpse of life through Connor’s eyes and would recommend this eBook to anyone (adult or child) who knows someone with Asperger’s Syndrome. Hopefully, Jodi will turn this into a series and allow us to see more of Connor’s world. I, for one, can’t wait. Spaghetti Is NOT a Finger Food is available from Amazon.com for the Kindle Fire, Kindle Cloud Reader, Kindle for iPad, and Kindle for Android. B has also posted her take on Spaghetti is NOT a Finger Food. Disclaimer; I purchased this book from Amazon and decided to review it. The opinions above are my own. I wasn’t compensated by anyone for this review, however the above link to the book is an affiliate link. Absolutely thrilled by how much you enjoyed my book. Connor feels like my third child and seeing his story touch so many lives has been the reward of a life time. As soon as my publisher gives me the green light, I’m full steam ahead with the next Connor book. Thank you for this detailed and insightful interview. It’s great to have a dad’s eye view of the book, as well as reading some of the parallels between Connor and NHL. I can’t wait for the book to come out in print. And I’m with you on the sequel, that would be awesome.